Lumley Castle is fast becoming one of my favourite places in the North East and I'm eager to spend as much time as I can there this year exploring the magical corridors, climbing in and out of wardrobes (there's bathrooms hidden in some you know!) and trying to avoid Lily of Lumley who haunts the corridors! 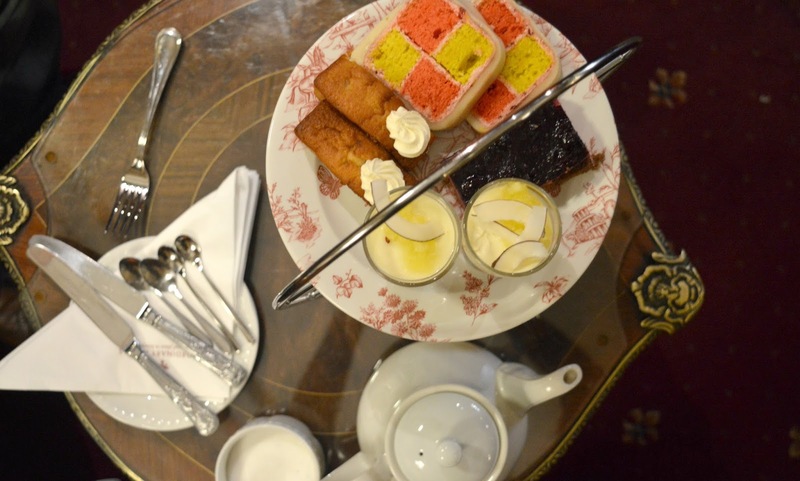 So it only seemed right that we tried out the afternoon tea at Lumley Castle. Afternoon Tea on a chillier day is definitely best enjoyed snuggled by a fire so we were thrilled to settle down at a cosy table in the Library right beside the fireplace, perfect for keeping my feet nice and warm, although perhaps not so great at encouraging me to stay awake - I really wanted a fireside nap! 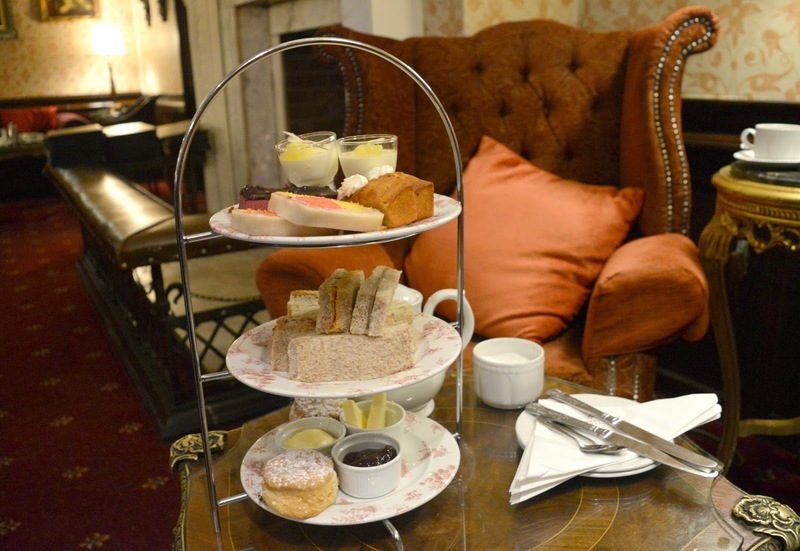 There's a choice of four afternoon teas at Lumley Castle, we opted for the Grand Afternoon Tea (£14.95 per person) and settled ourselves down for an afternoon of dainty treats followed by a sugar rush. Just how we love to spend a Sunday afternoon! Our food was slow to arrive with the Castle being stretched to capacity during our visit. A wedding show on top of Sunday lunches meant a lot of people were about that day and things were a little hectic. 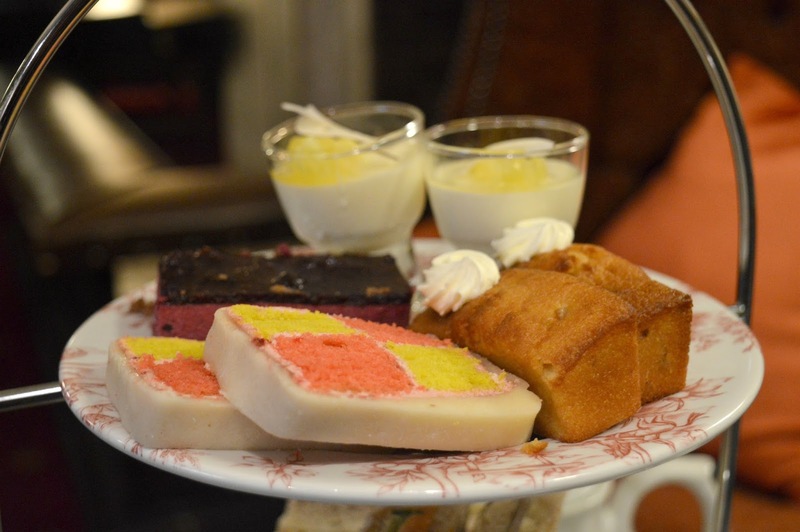 Our afternoon tea was booked for 3:00 pm and by the time it arrived in front of us it was around 3:40 pm. 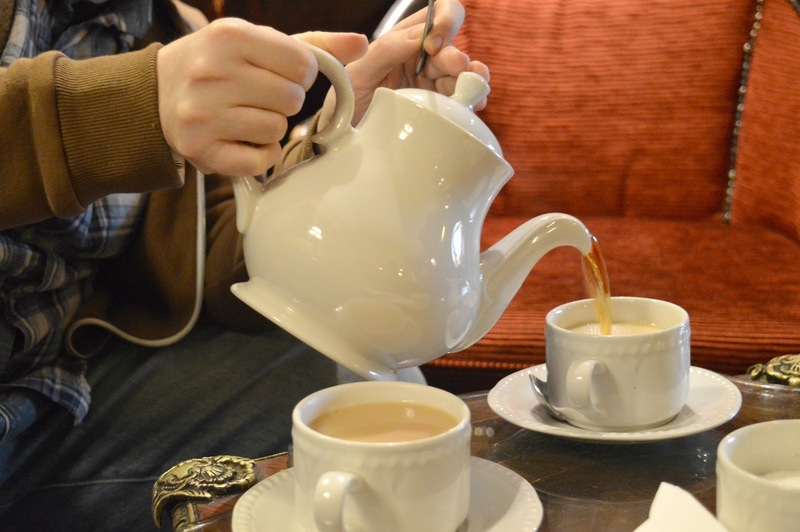 We didn't mind as the staff were so lovely and apologetic and we were more than happy to chat by the fire and drink endless cups of tea. When the cake stand arrived we agreed it was worth the wait, every inch was covered in a delicious looking treat and we eagerly armed ourselves with cake forks and miniature spoons ready to dig in. The sandwich tier was overflowing to the point where we couldn't quite work out if there were two of each filling. This meant that we ended up cutting each sandwich in two to share before realising towards the end that there had been two of each. Hilarious! 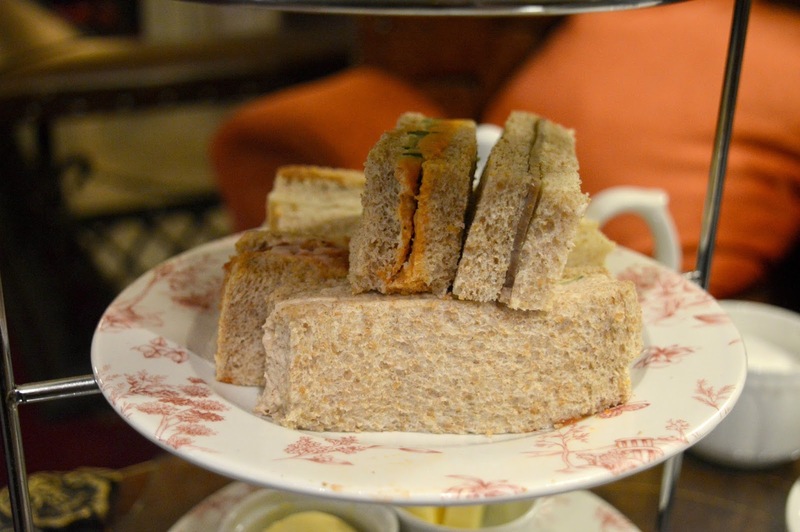 We enjoyed our savoury tier with the finger sandwiches going down a treat. Determined not to get too full up we moved up to the cake tier working from the lightest looking treat first. Saving the best till last and we were on to the scones. We were served one each (good job after all that cake) served with the obligatory pots of jam and cream. The scones were a little crumbly but delicious. As usual I slathered mine in a greedy amount of cream, leaving only a tiny amount for my husband (I will not be winning "wife of the year"). Regular readers wont be surprised to hear that we polished off the lot and our cakestand went back to the kitchen without so much as a crumb left on it! 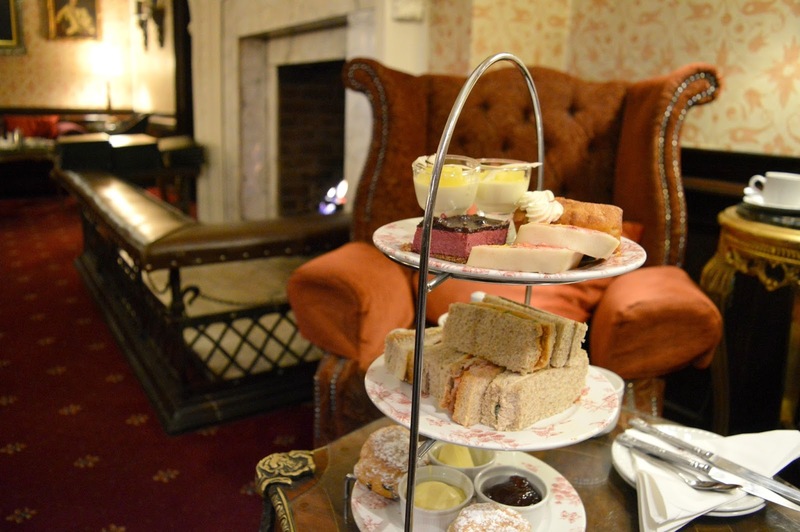 We enjoyed a complimentary afternoon tea thanks to our friends at Lumley Castle, however we were not asked to write this review, I just decided it was worth sharing! It looks gorgeous. 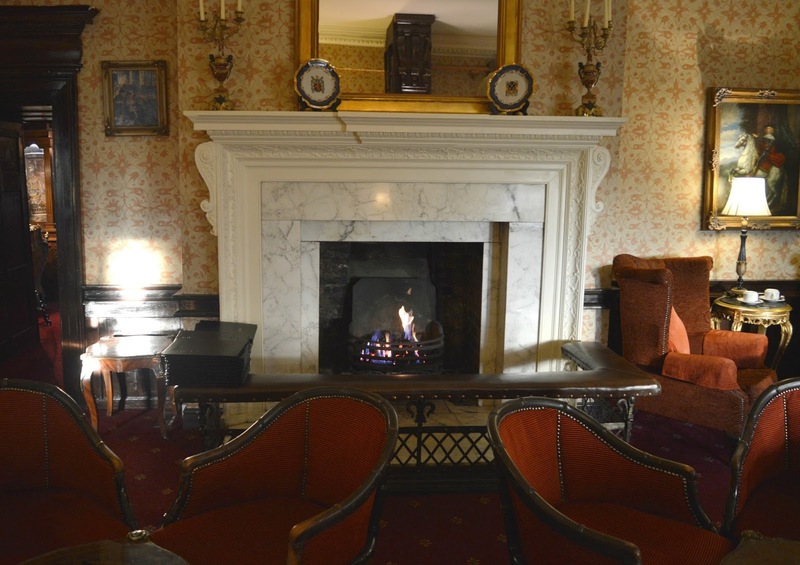 I fancy the idea of sinking back into one of those cosy chairs and enjoying the cakes. A cosy chair with your cakes is always the best, it allows for a little doze between courses!